How to convert dynamic disk to basic disk without losing data? This post shows you how to convert dynamic disk to basic without data loss using free partition management software. If you want perform such conversion, follow this guide. Basic disk refers to a disk that contains partitions, such as primary partitions and logical partitions and they are in turn formatted with a file system to become a volume for file storage. Basic disk provides a simple storage solution that can accommodate a useful array of changing storage requirement scenarios. Basic disks also support clustered disks, Institute of Electrical and Electronics Engineers (IEEE) 1394 disks, and universal serial bus (USB) removable drives. For backward compatibility, basic disks usually use the same Master Boot Record (MBR) partition style as the disks used by the Microsoft MS-DOS operating system and all versions of Windows but can also support GUID Partition Table (GPT) partitions on systems that support it. 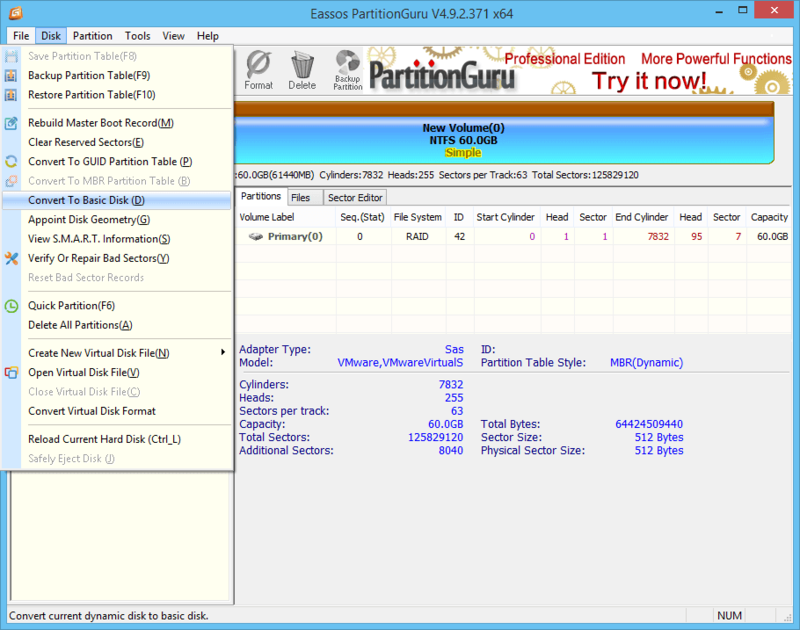 For more information about MBR and GPT partition styles, see the Partition Styles section. Dynamic disks provide features that basic disks do not, such as the ability to create volumes that span multiple disks (spanned and striped volumes) and the ability to create fault-tolerant volumes (mirrored and RAID-5 volumes). Like basic disks, dynamic disks can use the MBR or GPT partition styles on systems that support both. All volumes on dynamic disks are known as dynamic volumes. Dynamic disks offer greater flexibility for volume management because they use a database to track information about dynamic volumes on the disk and about other dynamic disks in the computer. Because each dynamic disk in a computer stores a replica of the dynamic disk database, for example, a corrupted dynamic disk database can repair one dynamic disk by using the database on another dynamic disk. The location of the database is determined by the partition style of the disk. On MBR partitions, the database is contained in the last 1 megabyte (MB) of the disk. On GPT partitions, the database is contained in a 1-MB reserved (hidden) partition. Dynamic disks are a separate form of volume management that allows volumes to have noncontiguous extents on one or more physical disks. Dynamic disks and volumes rely on the Logical Disk Manager (LDM) and Virtual Disk Service (VDS) and their associated features. These features enable you to perform tasks such as converting basic disks into dynamic disks, and creating fault-tolerant volumes. To encourage the use of dynamic disks, multi-partition volume support was removed from basic disks, and is now exclusively supported on dynamic disks. The conversion can be performed by PartitionGuru. PartitionGuru can recognize dynamic disks and operate them just as common disks, formatting, copy files, data recovery, partition backup, etc. 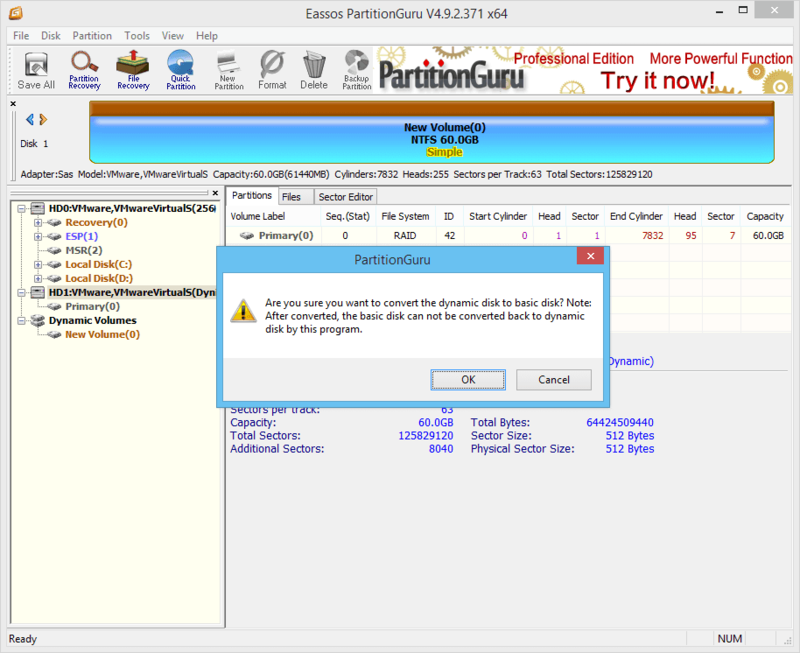 Also PartitionGuru Pro is able to convert dynamic disk to basic disk. And the conversion won’t affect data on these disks. Step 1: Run PartitionGuru and you can see the dynamic disk on the main interface. Step 2: Select the dynamic disk and click menu Disk to select Convert to Basic Disk. Step 3: Click OK button to make the changing work. This entry was posted in Partition Manager and tagged basic disk, convert dynamic disk to basic disk, dynamic disk, PartitionGuru by EASSOS. Bookmark the permalink.